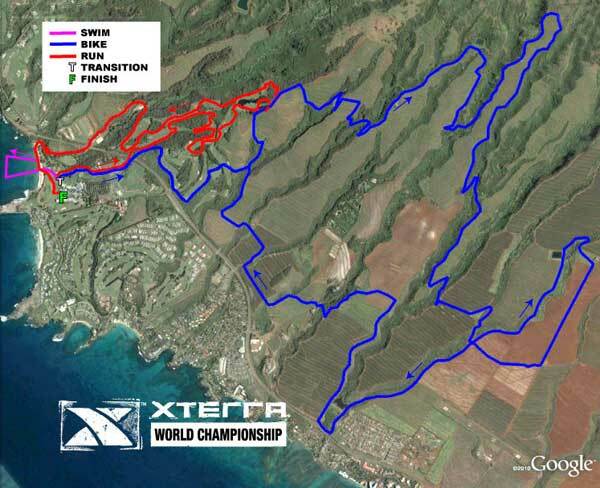 The 2012 XTERRA will also be held at Kapalua, Maui on Sunday, Oct 28, 2012. 800 world class tri-athletes from around the world compete in the world's premier off-road triathlon. The vent combines a 1 mile rough water swim with an 18.3 mile mountain bike trail ride and a 6.1 mile trail run. Don't wait too long, our bike rentals book well in advance of XTerra! Make your Maui bike rental reservation NOW! Be certain to have a bike rental available for riding the same Maui mountain bike trails the competitors ride and train on for XTerra World Championships on Maui. Subscribe to our Maui bicycle blog to keep up with the latest Maui bike news and information about the 2012 XTerrra at Kapalua!